San Sebastián is a city truly blessed. It has not one, but two of the few really nice city beaches in Europe - Playa de la Concha, right near some of the city's major historical buildings, and Playa de Gros, where there's also great surfing. Our picks of the best places to stay in San Sebastian are well placed for access to either. San Sebastian also has the wonderful culinary culture of the Basque country. A lively and beautiful old town the Parte Vieja, and plenty of interesting local museums, markets and charming old buildings. The swimming off Playa de la Concha is almost always safe and there's plenty of sand to share between the many tanned bodies. Playa de la Concha even has its own little isle, sitting neatly in the pretty harbour, just 700metres off shore. At low tide this has its own beach and you can be reached aboard glass-bottomed boats which leave every half hour or so. Playa de Gros is a bit more dangerous for swimmers but that's what makes it a great surf beach, both for beginners and more experienced surfers. For a good view of the whole town take the old funicular up Monte Igueldo and appreciate the Bahia de la Concha as a panorama. As well as the views you'll also find a slightly kitschy little theme park. San Sebastián is a stylish city and it wouldn't get that way without a collection of high end boutiques. Famous for food, San Sebastián has three Michelin star restaurants. But what they're really known for are their pintxos - Basque tapas. Like many of the best places to stay in San Sebastián, you can also find many of the best pintxos bars in Parte Vieja. Surf the waves on the Playa de Gros, well known for great breaks. Bask under the sun on the picturesque Playa de la Concha. Visit San Sebastian’s city hall regarded as an architectural masterpiece. View the fantastic displays of Basque history from prehistoric times to modernity at Museo de San Telmo. Stop by as many pintxos bars as possible which offer delectable traditional Basque dishes and wines. With so much on offer many of the best places to stay in San Sebastian and quickly snapped up so be sure of your booking and and start planning. 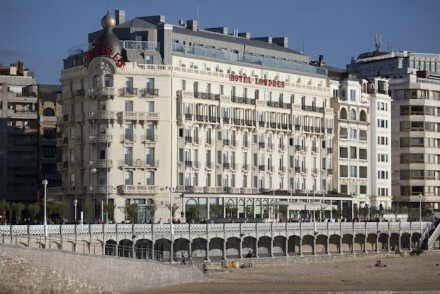 The Hotel de Londres y de Inglaterra is a wonderfully grand hotel sitting proudly overlooking the beach and San Sebastián’s La Concha Bay. There are 167 generously proportioned rooms in traditional style, with private balconies and a fantastic restaurant known for superb Basque cuisine. 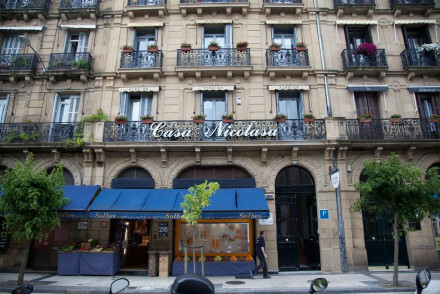 Casa Nicolasa guesthouse is situated just a short distance from the sea in coastal San Sebastián. It offers chic and contemporary accommodation with parquet floors and all rooms come with a TV. If you want to be close to the beach and the centre of town, Astoria7 is one of the best places to stay in San Sebastián. 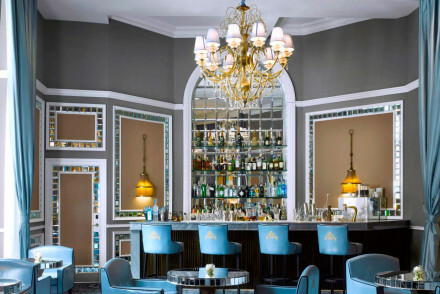 Sleek and contemporary, this hotel is themed around the city's Film Festival, with rooms featuring stars of the silver screen. Doubles can be booked for as little as €74 per night. For something special, stay at the Hotel Maria Cristina. A magnificent Belle Epoque palace with 136 gorgeously decorated rooms and suites. Each room has glamorous furniture and great art on the walls, and there are two restaurants. It really is like staying in a palace, so if you're planning a honeymoon, this is ideal. 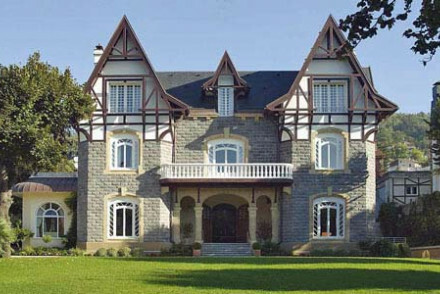 If you want to explore more of the Basque country surrounding San Sebastian, maybe a country house hotel style property will suit you better? One of the best places to stay in San Sebastián if that's what you're looking for is the Hotel Villa Soro. Still close to the beach and some fantastic restaurants, it also has the peaceful grounds and larger living spaces which make country house hotels such great options if you're looking for a more permanent base. If you feel that your needs are better suited to an apartment or holiday villa, then we suggest you visit our online partner Booking.com, where you'll find a wide range for all tastes and budgets. San Sebastian airport (20km from the city centre) has links to all major Spanish airports. For international flights you'll need to go to either Bilbao (105km) or Biarritz airport, just over the border (47km). San Sebastian is a great year round destination, but if you want to enjoy the beach as well as the culture then you should visit between June and September when average high temperatures are around the mid 20s C.
For the best car hire prices, we recommend you visit our online partner Rentalcars. 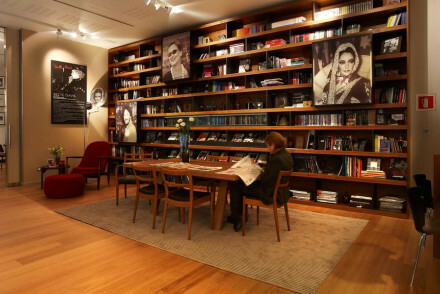 Browse through our list of all the best places to stay in San Sebastián. Expand your search to include all the best places to stay in the Basque Country. A sleek contemporary hotel in the town centre and close to the beach. Large modern rooms and suites with all the mod cons. Restaurant, library, gym and meeting rooms. A stylish spot with easy access to the city's best restaurants. Value chic - Sleek contemporary rooms and suites with prices from as little as €74 per night. Casa Nicolasa guesthouse is situated just a short distance from the sea in coastal San Sebastián. It offers chic and contemporary accommodation with parquet floors and all rooms also come with a TV. Whether you fancy city exploring or beach dwelling, this great value spot is ideal for you! A lovely country house close to the beach. Sophisticated rooms with elegant furniture and private terraces. Beautiful gardens and smart living areas. Walking distance to some fantastic restaurants. A lovely base to explore the city from. Great walks - Climb Monte Urgull. 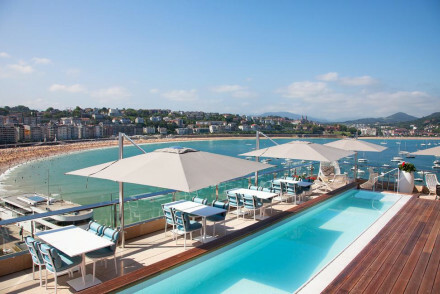 A smart 4-star hotel set in historic San Sebastian offering bright contemporary accommodation. Boasting a fabulous rooftop with panoramic views of La Concha Bay and the Old Town and a modern restaurant serving Basque cuisine. With easy access to the Old Town this comes highly recommended. Romantic Break - The rooftop terrace has panoramic views of the city and La Concha Bay. Beach Life - Located just a short stroll to the nearest beach. Great walks - Enjoy a stroll through picturesque San Sebastian Old Town. Sights nearby - Visit the iconic Buen Pastor Cathedral. A grand-hotel standing proud over La Concha Bay. Generously proportioned rooms are traditional in style with pretty french windows leading onto private balconies. Enjoy the famed Basque cuisine in the elegant restaurant. Just steps from the beach, it's ideal for an indulgent seaside escape. Local exploring - Ideally located for exploring both San Sebastian and Basque country further afield. Beach Life - Boasting an impressive location overlooking the picture perfect bay of La Concha. Great walks - Take a relaxing stroll along the boulevard and check out the sights and sounds of the Parte Vieja. A truly magnificent hotel with Belle Epoque splendour. Exquisitely decorated rooms and suites have romantic paintings, glamourous furniture and all the mod cons. Two fantastic restaurants, banquet rooms, terraces, and meeting areas. A magical spot. Romantic Break - Beautiful rooms, trendy cocktail bar, luxury and great service....woo your loved one in style! Foodies - San Sebastian is the perfect destination for a gastronomic city break. 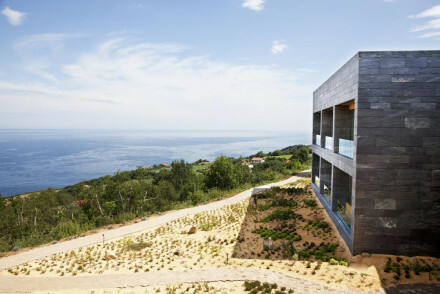 A beautifully designed 5 star boutique hotel offering glorious views over the sea. Minimalist rooms feature large expanses of glass letting the outside in. The three star Michelin restaurant is undeniably the draw serving innovative cuisine at its very finest. There is an indulgent spa too. Foodies - The real draw, beyond the 5 star boutique hotel, is Pedro Subijana’s Akelarre restaurant holding 3 Michelin stars. Sights nearby - Visit the magnificent San Sebastián Cathedral.